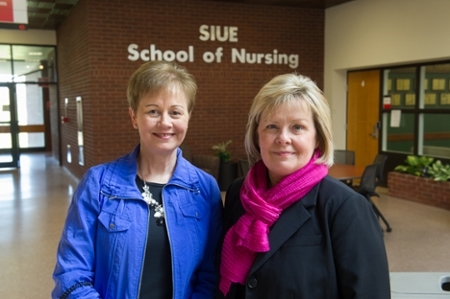 The Southern Illinois University Edwardsville Schools of Business and Nursing have partnered to prepare advanced practice nurses and nursing administrators with a concurrent master’s in business administration (MBA) and a doctor of nursing practice (DNP). The DNP program immerses students in evidence-based practice, focused coursework, experiential learning and development of a DNP project that has the potential to improve patient outcomes. The MBA program is designed to develop the professional capabilities of managers working in business, focusing on topics such as quantitative analysis, decision-making, negotiation, enhancing quality, and innovation and program management. The concurrent program is offered primarily online; includes two on-campus immersion experiences; and is beneficial for nurses with master’s preparation as administrators, nurse practitioners, certified registered nurse anesthetists, midwives or clinical nurse specialists. For more information on the MBA/DNP program, visit siue.edu/mba-dnp. Photo: (L) Dr. Kathy Ketchum, assistant dean for graduate programs in the SIUE School of Nursing and (R) Dr. Janice Joplin, associate dean in the SIUE School of Business.